Summer Time Sankey: Ice, ice, baby! The charchitecture blog is run by a “third year architecture student in Bill Sherman’s Building, Sites and Systems course”. The below Sankey diagrams are from a November 2011 post and covers the topic of refrigeration. 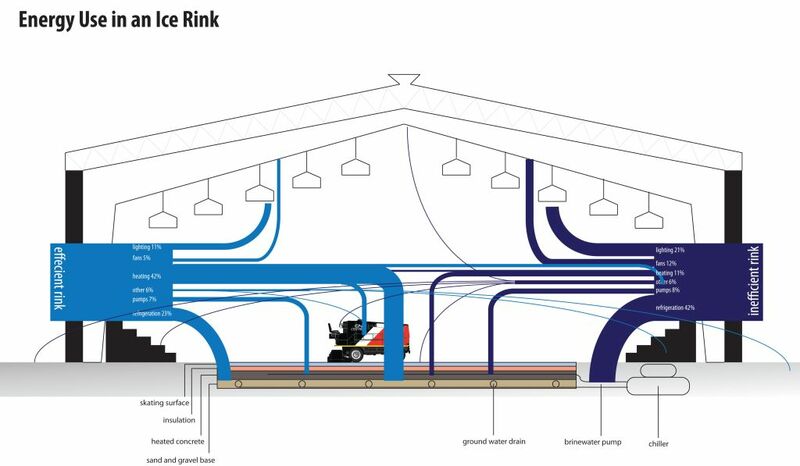 The first Sankey diagram depicts a cross section of an ice rink and shows a breakdown of the energy use in an inefficient ice-rink. In the second Sankey diagram an efficient and an inefficient ice-rink are compared. Sankey arrows represent relative shares in percent, not absolute values. Hence in the second figure the height of the stacked Sankey flows (100%) is the same for the inefficient as for the efficient ice-rink. I think that a direct comparison of the energy consumption is not intended here, but only the different distributions. The original post has more basic information on refrigerations and explains technologies that can be used to save energy. Now that’s cool… my summer time post for you.